Port Richmond, seen from Bayonne, New Jersey across the Kill Van Kull. 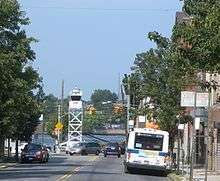 Port Richmond is a neighborhood situated on the North Shore of Staten Island, a borough of New York City. It is along the waterfront of the Kill Van Kull, with the southern terminus of the Bayonne Bridge serving as the boundary between it and Elm Park, the neighborhood which borders it on the west. Formerly an independent village, it is one of the oldest neighborhoods on the island. In the 19th century it was an important transportation and industrial center of the island, but this role has vanished nearly completely, leaving a largely blue collar residential area bypassed by the shift of development of the island to its interior after the 1960s. The formerly bustling commercial center along Richmond Avenue (now Port Richmond Avenue) had been largely abandoned at the time, But in recent years many small businesses have opened in the area with the commercial activity shifting inland to Forest Avenue (or leaving the neighborhood altogether and relocating to the Staten Island Mall when the latter opened in the summer of 1973). The first white European contact with Staten Island was recorded in 1524 by Giovanni da Verrazzano. In 1609 Henry Hudson established Dutch trade in the area and named the island Staaten Eylandt after the Staten-Generaal, the Dutch parliament. However, it was not until the mid-17th century that a mixed Dutch and French settlement was established at New Dorp. Settlers established a cemetery at nearby Port Richmond, which served as the burial ground for residents of northern Staten Island until 1696. The community of Port Richmond grew up around this cemetery, beginning with the Dutch Reform Church that was built there in the early 18th century. This colonnaded Church, still standing on Port Richmond Avenue was built in 1824 after a fire destroyed the original building. From those Dutch roots, Port Richmond evolved into a thriving waterfront industrial and transportation hub. The village incorporated as Port Richmond in 1866, the same year as the Staten Island villages of New Brighton and Edgewater. In 1700 the area was known as the "burial place" from a cemetery of the Reformed Church on Staten Island near the present Port Richmond Avenue along the waterfront. It later became a transfer point between ferries from New York City to New Brunswick, New Jersey. A ferry landing (called variously "Ryer's Landing", "Mercereau's Landing", and "Decker's Landing") was later constructed for a route linking Staten Island across the Kill Van Kull to Bergen Point (present-day Bayonne, New Jersey). The Bayonne Bridge was constructed in 1931 yet ferry service continued until 1962. Port Richmond's location on the Kull Van Kill made it a prime ferry launch from Staten Island to New Jersey. It was a transfer port for freight and passengers traveling by boat between New York City and New Brunswick, New Jersey. This point is the part of Staten Island closest to Port Elizabeth, New Jersey and was once called Mersereau's Point, after Mersereau's Ferry. This point was also known as Lambert's, Collyer's, and Bowman's Point. It was called Lambert's Point during the Revolutionary War and later Collyer's Point. Other ferries that operated from that point were: Dacosta's, Indian, Decker's, Ryers', and Hilleker's. Ryers' and Hilleker's ferries were in competition with one another until David Mersereau bought out both companies in the late 19th century. Ferries ran continually until shortly after the Bayonne Bridge was built in 1931. The area also became the site of an important stop on a coach route between the city and Philadelphia. Port Richmond Avenue has been known over the years as Church Road, Port Richmond Plank Road, Stone Road, and Richmond Avenue. The road is a continuation of an old highway called the Morningstar Road. Cornelius "Commodore" Vanderbilt, railway tycoon and patriarch of the Vanderbilt family, was born in the area in 1797. In 1836, former Vice President Aaron Burr died in Port Richmond at the St. James Hotel, a prominent hotel which once stood on Richmond Terrace until it was demolished. In the early 19th century, the area was an overnight coach stop between New York City and Philadelphia. In 1836, a public park was built. In the middle 19th century, the area began to attract immigrants from Ireland and Germany. Among the industries established in the area was the only whale oil processing plant on Staten Island. It was later replaced by a linseed oil processing plant that operated until the 20th century. Other industries included lumber and coal yards, as a dye processing plant. Because oyster harvesting was a booming business along the mudflats in New York Harbor, many successful oyster boat captains built mansions on Richmond Terrace facing the Kill van Kull in the 1840s and 1850s. Industries along the waterfront included lumber and coal yards. The general appearance of Port Richmond is inviting and pleasing. In 1866, the neighborhood was incorporated as Port Richmond. In the 1880s, the Staten Island Railway constructed a North Shore branch with a stop in the village on Richmond Avenue, which had become a main shopping area of the island. In the 1870, St. Philip's Baptist Church, the oldest of the three black Baptist congregations on the Island, was formed. The church still stands at 77 Bennett Street, right next door to the Port Richmond Library. At the beginning of the 20th century, it attracted large numbers of Italian, Polish, Norwegian, and Swedish immigrants. A public library was built with funds from Andrew Carnegie in 1902. Temple Emanu-El erected its domed, Classical building in 1907. When telephone service was upgraded in New York City in December 1930, a telephone exchange bearing the designation "Port Richmond 7" was created, its territory including the neighborhood itself along with many other communities on the western and central North Shore plus the island's then-sparsely populated, rural interior. This exchange was disconnected in 1948 when a "Port Washington 7" exchange was established to serve the town by that name in Nassau County, on Long Island; the Port Richmond exchange's customers were then moved to exchanges that heretofore had been found to the east, such as "Saint George 7." The neighborhood suffered a severe economic decline in the latter half of the 20th century, largely as a result of the shift of development and commercial activity to the center of the island, following the construction of the Verrazano-Narrows Bridge. The North Shore Branch of the Staten Island Railway that ran through the neighborhood connecting it to St. George was mainly a freight railroad. It was owned by the Baltimore and Ohio Railroad and was briefly, in 1925 and 1926, used as a passenger service link to the ferry launch at St. George. This was suspended as the boat ride was slower than the trip usual B & O trip to its usual terminal at the CNJ Terminal in Jersey City, New Jersey. During World War II some trains were used to move troops. This branch was closed in 1953, leaving behind a dilapidated track and Port Richmond station along Richmond (now Port Richmond) Avenue. Plans for reopening this line were studied at various times during the 1990s and early 2000s as a Staten Island light rail line. As of the 2010 census, the demographics of Port Richmond were roughly 26.7% White, 21% Black, 45.7% Hispanic, 3.7% Asian, 3.9% Other. The Black and Latino populations are largest in the northern section of the neighborhood, near Richmond Terrace. The southeastern portion of the neighborhood (roughly south of Post Avenue & east of Port Richmond Avenue) is the section with the largest percentage of Whites (almost 50%), and is sometimes referred to as "Port Richmond Center" or "Upper Port Richmond". The median household income in the neighborhood is roughly $45,000 a year. This is defining Port Richmond as everything within the boundaries of Census Tract 207, 213, and 247, as well as Block Group 1 of Tract 201. The 10302 zip code (which is mostly Port Richmond, but also includes part of Westerleigh) has the highest percentage of Hispanics of any zip code on Staten Island, at 41.3%. Within the Hispanic population, it is the only zip code on Staten Island where Mexicans outnumber Puerto Ricans: Mexicans make up 20% of the population of the zip code. The zip code includes parts of nearby Westerleigh, so Mexicans make up roughly 23% of the population of Port Richmond, with the presence being highest along Port Richmond Avenue, and in the northern part of the neighborhood in general. Port Richmond has long been plagued by high levels of crime, such as prostitution, drugs and violence. However, much of it takes place in the northern part of the neighborhood, north of roughly Post Avenue. In 2009, findings showed that Port Richmond (zip code 10302) received a 7 on a scale of 1-10 in terms of violent crime level - the highest for any zip code on Staten Island (one other Staten Island zip code also received a 7). The United States violent crime average for a zip code is a 3. Port Richmond also received a 6 on an identical scale measuring property crime. The United States property crime average for a zip code is also a 3. The African-American community that had long occupied Port Richmond's Northern quarters began to see a large influx of Mexican immigrants move in alongside them starting late in the 1980s. The Mexicans transformed many boarded up storefronts along Port Richmond Avenue and quickly made the commercial strip the center of Latino culture on Staten Island. Still many of Port Richmond's Mexicans line busy neighborhood streets every morning looking to be picked up for work as day laborers. Since they often commute on foot and usually have money in their pockets, the immigrants have long been targeted for violent muggings and senseless attacks on Port Richmond streets. The tensions between the area's long-time inhabitants and its newcomers have been well documented for years. Several outreach groups have since popped up to address the community's issues. Still, mistrust persists on both sides of the fence, as portions of northern Port Richmond (especially west of Port Richmond Avenue) have shifted from being predominantly Black to predominantly Hispanic. This led to an incident, whence in the early morning hours of April 5, 2010, 26-year-old baker Rodulfo Olmedo was on his way home from a local club on Port Richmond Avenue when he was set upon by three African-American and one Hispanic teenagers, who badly beat Olmedo with unidentified objects believed to be baseball bats or wooden planks and possibly a chain before robbing his unconscious body of cash and a cellphone. After being helped by a passer-by and brought to the hospital, Olmedo, a 13-year resident of the U.S., told police that throughout the attack, which was captured on nearby surveillance cameras, he was verbally discriminated against. The attack provoked outrage both politically and locally, but while many felt the attack was solely a result of the victim's nationality, the attackers insisted that they knew Olmedo and were merely settling an earlier score with him. Regardless, the incident caused similar but unpublicized incidents, which had been taking place, to be publicized. After the incident, the United States Department of Justice began assisting community officials in their efforts to develop a neighborhood watch or a "Crime Response Team", a group of citizens that would possibly work with the NYPD to report suspicious activity and prevent more violence in the neighborhood, as well as to organize a series of meetings to facilitate community dialogue. They also set out to create "safe spaces", which was not the first time the idea was floated. These are willing businesses that are open late, such as bodegas or delis, where people who feel like they are being followed or otherwise fear for their safety, can seek refuge and be assisted by workers with contacting the police. Northfield Community Local Development Corp. - 160 Heberton Ave., founded in 1978, develops and manages affordable housing, is a HUD-certified counseling agency, packages first-time home buyer financing as well as loans and grants to small businesses through Main Streets program, provides financial and home-buying education workshops and weatherization services throughout Staten Island. Port Richmond Anti-Violence Task Force - Deals with the neighborhood's extensive criminal dealings, specifically Mexican immigrants being targeted for robberies and random assaults by the area's black youths. Make the Road New York - Promotes economic justice, equity and opportunity for all New Yorkers through community and electoral organizing, strategic policy advocacy, leadership development, youth and adult education, and high quality legal and support services. Also serves two other struggling New York City minority communities in two other boroughs. Eye Openers Youth Against Violence - A Staten Island youth group that started in Port Richmond with the aim of addressing simmering tensions between blacks and Hispanics by providing a forum of communication for teens from various ethnic backgrounds. Project Hospitality - A Staten Island interfaith effort feeding the hungry, sheltering the homeless, and caring for people with HIV/AIDS, started and is still based in Port Richmond. El Centro de Hospitalidad (Latino Civic Association of Staten Island) - Educates Port Richmond's large Latino immigrant day laborer community and provides them with breakfasts, a place to wait for work, Bible study, clothes drvies, among other things. Port Richmond Improvement Association - A community group that holds events to inform community members of important things taking place and to help bridge the gap between the NYPD and the area's residents, also allowing them to have their voices and concerns heard. Community Health Action of Staten Island (formerly Staten Island Aids Task Force)/Port Richmond Wellness Center - Helps the relatively large amount of neighborhood residents living with HIV/AIDS. Community Health Center of Richmond - Staten Island's first community owned and operated primary health clinic. The center is aimed at the poor and/or uninsured, providing affordable health care to Staten Island residents (especially those in Port Richmond) regardless of their ability to pay. Amazing Grace Interfaith Church - A Staten Island church that, with the help of volunteers, holds monthly giveaways of clothes and other necessities to the poor and needy at Port Richmond's Levy Playground. Community By Community - A non-profit organization based in Port Richmond that is dedicated to helping young people through various initiatives and programs including providing them with productive activities to partake it to keep them off the streets. In March 2008, local Wagner College chose Port Richmond as its target community to begin a five year plan between the college and seven community groups with the intention of focusing all of Wagner's volunteer activities squarely on the one community in hopes of improving the overall quality of life for the neighborhood's residents by curbing several disturbing trends in the neighborhood ranging from poor health care access, youth obesity, racial/ethnic tensions and youth violence to limited economic and educational opportunities. The students would then be required to report on their progress as part of their course requirements with the ultimate goal being to make significant improvements in the aforementioned fields and eventually branching out to other distressed North Shore neighborhoods. The Port Richmond initiative was lauded by former president Bill Clinton at The Clinton Global Initiative University (CGI U) Meeting on February 14, 2009 at the University of Texas at Austin before a star-studded crowd. The CGI U is the college student/administrator-based offshoot of his Clinton Global Initiative, a non-partisan organization that convenes global leaders to devise and implement innovative solutions to the world's most pressing problems. New York Public Library operates the Port Richmond Branch at 75 Bennett Street at Heberton Avenue. Throughout the 19th Century the Port Richmond area had sporadic library service. Interest in a library began in 1833. Various private library groups opened. Andrew Carnegie financed the Port Richmond Branch, which became Port Richmond's permanent library. The New York City Department of Education serves Port Richmond. Port Richmond High School is located in Port Richmond. Port Richmond High School had a new building constructed in 1993, but the school was originally opened in 1927. The school has about 2,700 students and is known as one of the best high schools in Staten Island. The high school has a reputation for excellence in sports and academics. Newsweek has named Port Richmond High School in its list of "Best High Schools" in many recent years. The local middle school is Markham Intermediate School, located at 20 Houston Street in Westerleigh. Local elementary schools include P.S.20 and P.S.21. Port Richmond is the site of the Castleton Bus Depot, at Castleton and Jewett Avenues. It is served by many local and express buses, including the S40, S44, S46, S48, S53, S54, S57, S59, S66 local buses, S89, S90, S94, S96, S98 limited-stop buses, and X10, X14, X30 express buses. The abandoned North Shore Branch of the Staten Island Railway runs through Port Richmond, and its station still stands. The Ritz Theater was built in 1924 by Sol Brill, who was also responsible for the construction of the Liberty, New Dorp, and St. George Theaters, all of which are also located in Staten Island. The spacious theater boasted over 2,100 seats. The theater was a prime rock venue in the 1960s and 1970s; the Kinks and Jethro Tull have played here. The Ritz later became the home of rock concerts and roller skating, which made the Ritz one of the integral entertainment venues on Staten Island for many years. During the blizzard of 1947 the theater's marquee was destroyed and was never restored. Since 1985, the theater has been owned and operated as a tile showroom by the Pedulla family. Portions of the theater's original function can still be seen inside, and its famous murals still grace the walls. Now essentially a retirement community, it is one of the few remaining examples of 19th-century school buildings in Staten Island. Old PS 20 was the site of a school since 1842, when the two-story brick building and old stable served as classrooms for the students. The building that now stands on the site was built in 1891 after the old buildings were condemned for sanitary reasons. An addition to the 1891 construction was added in 1898 by James Warriner Moulton who attempted to give the addition what he termed greater "strength" and a "more manly character." The architecture of the building draws from a variety of styles including Romanesque Revival, neo-Classical, Italian villa, and Americanized Queen Anne. The hodge-podge of styles suggests a vernacular approach and reflects the reality of the 19th century, when school districts were responsible for designing, constructing, and maintaining their own buildings. Old PS 20 was within the Staten Island school district until it was disbanded following the consolidation of New York City in 1898. The bell tower on Old PS 20 is significant because it reflects civic pride. It was the first school building to have such an impressive tower and is the last remaining example. Old PS 20 was designated a Landmark Site by the Landmarks Preservation Commission in 1988. This is a 2 1⁄2-story frame building, is located on the eastern side of Veteran's Park, once the most fashionable locations in the neighborhood. Heberton Avenue is known for a plethora of handsome old houses. 121 Heberton, built by James G. Burger around 1859-61, is one of the most impressive. The residence is a rare surviving example in New York City of a picturesque villa in the Rustic style. The design combines elements seen in the pattern books of Gervase Wheeler, Calvert Vaux, and Samuel Sloan. Features associated with this style are broad gables, openwork brackets, long outside galleries, raised basement, and simple ornament. The house was first owned by a prosperous oysterman and abolitionist named Captain John J. Housman, then leased to tenants, and finally fell into the hands of the Brown family. The Browns had a number of notable family members in government in Richmond County. Though the house is no longer in the Brown family, it is still used as a residence today and recent renovations have preserved the unique historic quality of the house. The 121 Heberton Avenue House was designated a Landmark Site by the Landmarks Preservation Commission in 2002. It is a short walk from The New York Public Library and Veteran's Park. Bodine has had many names over the centuries, including Palmer's Run and Mill Brook. Near Bodine Creek was Bodine's Pond, used for years by various industries. The Richmond County Water Company once supplied water to the area, but when Bodine's Pond was eventually drained, the wells of the company were sunk in the remaining marsh. The edges of the pond are still visible on the landscape in the form of Columbia Street and Jewett Avenue. In 1922, the New York Times reported that a 13-year-old boy was killed by a train while crabbing from the railway trestle over Bodine Creek. Other fatalities have been reported from drowning and train accidents. The Port Richmond Hotel, a barracks-like building facing the Bayonne ferry terminal, was once the elegant St. James Hotel." The St. James Hotel was erected in 1787 remained until 1945, when it was demolished. As identified by a plaque on the Griffith Block building, it was the last home of Aaron Burr, the third Vice President of the United States. He died there on September 14, 1836. Built in 1845 in Greek revival style, this is the third church on the site. 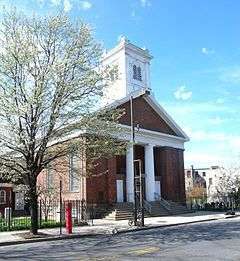 It was listed on the National Register of Historic Places in 2005 as the Reformed Church on Staten Island. The first, a hexagonal wooden building erected in 1714, was destroyed by the British during the revolution. The original building, a long structure around which the community now known as Port Richmond grew, was erected on land donated in 1714 by Governor Hunter. The original license to the Dutch Congregation signed by Governor Hunter in 1714 is preserved. The grounds also serve in commemoration of the Five Brothers from Staten Island who served in the Revolutionary War. The Daughters of the American Revolution recognized the The Brothers Mersereau: Joshua - 3rd Quarter Master General, Jacob - Colonel, Cornelius - Soldier, John - Captain, and Paul - Sailor. The cult classic movie release Combat Shock, the independent directing debut of Staten Island native Buddy Giovinazzo, is set in and was largely filmed in Port Richmond, where the main character dwells in apocalyptic squalor. The movie has been hailed for its raw depiction of inner city life and use of the gritty streetscapes it was filmed amid. Port Richmond (Castleton Avenue near its intersection with Jewett Avenue) is briefly shown in the independent film Big Fan as the main characters first cross into a seedy neighborhood while following their favorite football player to an apparent drug deal. After the shot of Port Richmond is shown, one of the men lament the kind of neighborhood they are beginning to enter and mistakenly refer to it as Stapleton. In December 2009, Arcadia Publishing released a book named Port Richmond on its Images of America product line about the neighborhood's history, including its ethnic diversity and the effect various immigrant groups have had on the community. The book was written by Phillip Papas and Lori R. Weintrob. Port Richmond has been mentioned in various songs by musicians ranging from Hip Hop heavyweights like Method Man, Ghostface Killah, Nicki Minaj, Raekwon and Shyheim to lesser known underground artists such as King Just, Fes Taylor and 9th Prince, the younger brother of legendary rapper/producer RZA. Aaron Burr, who died in Port Richmond at the Winants (also, Port Richmond) Hotel, but is buried in Princeton, New Jersey. John Henry Lake, Olympic bronze medal winner. Anning S. Prall, who was born in Port Richmond in 1870, Prall served as a U.S. Representative from New York and was Chair of the Federal Communications Commission from 1935 to 1937. He died in office in 1937. J. Walter Thompson, who lived in Port Richmond and served as an alternate delegate to the Democratic National Convention from New York in 1940, 1944, and 1948. Jacob Tyson, who was born in Richmond County, New York on October 8, 1773, the U.S. Representative from New York's 2nd District from 1823–1825 He also served as a member of the New York state senate from the 1st District in 1828. He died on July 16, 1848 and was buried at the Dutch Reformed Churchyard. ↑ Port Richmond Walking Tour, brochure. Preservation League of Staten Island, c.1995. ↑ "2010 Census Population for ZIP Code 10302". Zip-Codes.com. Datasheer, L.L.C. Retrieved April 21, 2013. ↑ "Property Address: Port Richmond Avenue & Grove Avenue, Staten Island, NY 10302". Neighborhood Scout. Location, Inc. Retrieved April 21, 2013. ↑ Silvestri, Pamela (September 12, 2009). "Economic Indicators: Port Richmond Avenue Up Close". Staten Island Advance. Retrieved 2010-01-17. ↑ Annese, John M. (April 12, 2010). "Seeking the American Dream on Staten Island, but living in fear". Staten Island Advance. Retrieved 2010-08-05. ↑ Spencer, Peter N. (April 19, 2010). 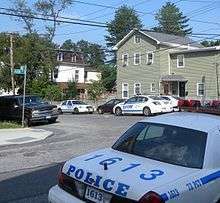 "Feds step up efforts to ease tensions between Staten Island ethnic groups". Staten Island Advance. Retrieved 2010-08-05. ↑ "About Us". Northfieldldc.org. Northfield Community Local Development Corporation. Retrieved April 21, 2013. ↑ "Who We Are". Make the Road New York. Retrieved April 21, 2013. ↑ http://www.chasiny.org/pages/cms.htm Archived October 27, 2009, at the Wayback Machine. ↑ http://www.northshorelij.com/NSLIJ/Mayor+Bloomberg+Marks+Launch+and+Expansion Archived May 21, 2012, at the Wayback Machine. ↑ Williamson, Lisa Ann (December 26, 2009). "Santa gets some help from Grace". Staten Island Advance. Retrieved 2010-01-17. ↑ Hart, Stephen (December 31, 2009). "Young Pool Sharks Test Their Aim in Port Richmond". Staten Island Advance. Retrieved 2010-01-17. ↑ Farinacci, Amanda (March 18, 2009). "Partnership To Focus On North Shore Community". NY1. Time Warner Cable Enterprises LLC. Retrieved April 21, 2013. ↑ http://www.wagner.edu/news/node/1129 Archived April 16, 2009, at the Wayback Machine. ↑ "Port Richmond Branch." New York Public Library. Retrieved 2008-12-22. ↑ Wilson, Andrew. "The Port Richmond Branch of The New York Public Library The First 50 Years: 1905–1955." Staten Island Historian. Volume 19, New Series 2. Spring 2002. Retrieved 2008-12-22. ↑ "Our History". Port Richmond High School. New York City Department of Education. Retrieved April 21, 2013. ↑ "Staten Island Bus Map January 2013" (PDF). Metropolitan Transportation Authority. January 2013. Retrieved February 18, 2013. ↑ "Ritz Theater". Cinema Treasures. Cinema Treasures, LLC. Retrieved April 21, 2013. ↑ 121 Heberton Avenue House, 121 Heberton Avenue, Staten Island : built c. 1859-61 : James G. Burger, designer and builder. New York: Landmarks Preservation Commission, 2002. ↑ Yates, James P. (August 30, 2009). "'Combat Shock's' Cult Status Surprises Former Staten Island Filmmaker". Staten Island Advance. Retrieved 2010-01-17. ↑ "Port Richmond". Arcadia Publishing. Arcadia Publishing. Retrieved April 21, 2013. Wikisource has the text of the 1911 Encyclopædia Britannica article Port Richmond.